Salmon offers a lighter alternative to rich meat dishes and always looks impressive. Preheat the oven to 200°C, gas mark 6. Smear half the butter over the base of a large, shallow roasting tin. (A large turkey roasting tin with sloping sides is ideal.) Place the salmon in the tin, positioning it diagonally to fit if necessary. You might need to cut the head off the salmon so it fits in the tin. Make sure you’ve spread butter under the whole fish, particularly at the tail end, otherwise it will stick. Slice one of the limes. Tuck into the cavity with two-thirds of the tarragon, two-thirds of the parsley sprigs and plenty of seasoning. Pour the wine into the tin and cover with buttered foil. Slice the beetroot very thinly and scatter into a large, shallow ovenproof dish. Cut the fennel into thin wedges, discarding any tough outer layers. Squeeze the juice from the remaining lime into a bowl. Dip the fennel wedges in the lime juice and scatter over the beetroot. Dot with a further 25g of the butter and season with salt and pepper. Place on the top oven shelf, cook for 20 minutes, then remove. Dot the fennel with the remaining butter and return to the oven. Place the salmon on the lower shelf. Cook both for 40-45 minutes until the salmon is cooked through. To test, gently pull the dorsal fin – it will come away easily once the salmon is cooked. Peel off and discard the skin. Carefully transfer the salmon to a serving platter, cover loosely with foil and keep warm. If the fennel and beetroot are cooked through, turn off the oven, or cook for a little longer if necessary. Strain the salmon cooking juices through a sieve into a small saucepan and boil until reduced by about half. Finely chop the remaining tarragon and parsley and add to the pan with the capers and cream. Cook until heated through. Check the seasoning and serve with the salmon and vegetables. 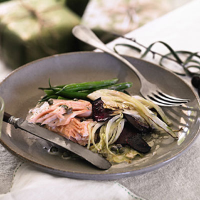 To ease the workload, prepare both salmon and vegetables on Christmas Eve, so you only need to pop them in the oven.